Having a child means your financial responsibilities increase tenfold. Aside from providing immediate needs, you also need to consider whether you’ll help pay for college expenses. I think all parents would prefer to help their kids pay for college. That said, everyone may not have the opportunity or the means to do so. If you really want to help financially when your kids go to college, you’ll have to make it a priority and add it to your budget. 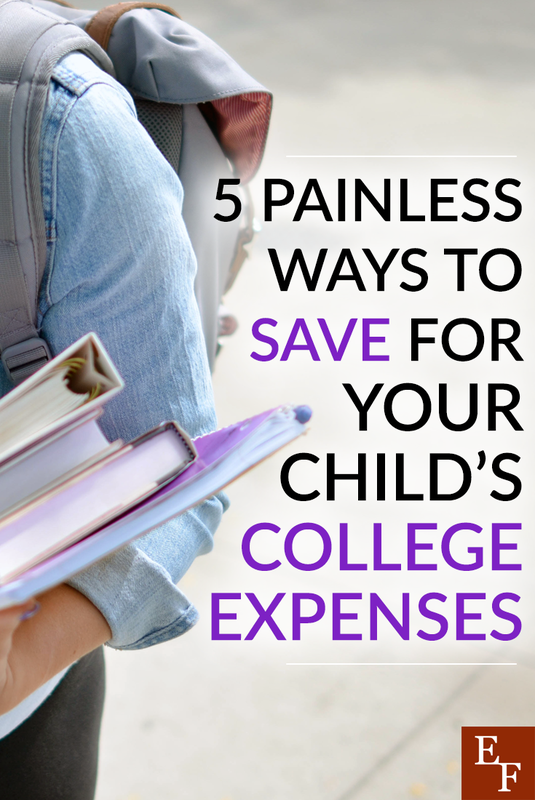 Here are 5 painless ways to save for your child’s college expenses. This is probably the most common way to save for college expenses. 529 plans are set up through the state and use mutual funds to invest the money for you. The funds you contribute can be tax deductible if they are made with pre-tax dollars. Plus, you can withdraw the money for education-related expenses tax-free. I opted to go with a 529 Education account. These plans are set up by the state, and use large mutual funds by companies such as Vanguard and TIAA CREF to invest the money for you. The funds can be taken out of your pre-tax salary, and education-related withdrawals are also tax-free, meaning you can save a nice chunk of change in the long run in taxes alone. The great thing about this savings method is that you can automate it and let compound interest do its work over the years. You don’t have to contribute a ton of money in the beginning if you can’t afford it as you can always increase your contributions. One thing people don’t like about 529 plans is how they can be restrictive at times in terms of what you can use the savings for. There’s no telling what type of college your child might want to go to or what other expenses they’ll have that you can help cover at the time. While you can use 529 funds to cover costs like room and board, your son or daughter may receive a scholarship that covers those expenses already and need help in other areas. They may even want to go to trade school and start a business right after high school. Who knows. Also, don’t forget about the online options, this can be much more affordable, you can check out the differences between Treehouse vs Pluralsight and find out which is the best online option. This is why automatic investing may be a better solution for more flexible future plans. You can open a brokerage account and have a set amount of money transferred from your checking account monthly. Robo-advisor investing sites like Motif help make automatic investing easy so you can reach your savings goal without having to put in a ton of effort and come up with your own strategy. You simply tell Motif what your goal is and how much you wish to contribute each month. Once you specify your risk tolerance, they do all the investing for you. The key is just to start saving early. Another painless way to save for your kid’s college expenses is by using real estate income. If you have another property that you rent out or plan to sell your home to downsize eventually, you can use that income to fund college expenses. This is something my husband and I hope to do. When we’re ready, we want to buy a rental house or either rent out our own home for extra income. The monthly cash flow along with our savings will help our son cover some of his college tuition costs and other expenses during college. If you don’t want to deal with being a landlord, you can get into crowdfunded real estate. This is where you become a part of a group of people who pool their money with other investors and lend it to real estate investment property owners. They do all the work and deal with renting the property out and maintaining it. You get to split the return with the other investors. Some crowdfunded real estate sites have strict income and net worth requirements, but sites like Realty Shares and Fundrise have more lenient requirements. Tip: Another idea is to list an extra room or space on Airbnb. Don’t want to get into real estate? Your best bet is to invest but you don’t have to invest in the stock market. You can also try peer lending. Peer lending is similar to crowdfunded real estate only you pool your money together with others to offer loans to borrowers. Some borrowers who can’t find good loan terms with a bank or private lender rely on sites like Upstart, Peer Street, and the Lending Club. These companies use your money to provide the loan funds and charge a slightly higher interest rate so you’ll get a decent return. You don’t need a lot of capital to start doing this and you can keep reinvesting your earnings over time to build up a solid stash of money for your kids’ college expenses. Letting your child pitch in and contribute to their college savings is a painless way to grow their account because it’s less work you have to do on your end. If your teen gets a job, you can require that they set aside 1/2 or 1/3 of their earnings for their college fund. If your child starts a part-time job around 15 and works through high school, that’s at least 4 years of savings. You can also start saving a portion of any gifts or cash they receive as kids. If they receive so much birthday money that they don’t know what to do with it, you can take 25% – 50% of it and deposit it into the college savings fund. You can even split their allowance between spending money and college savings. Over time, all of those small contributions will add up and they will appreciate having some money to spend during college years. When you think about it, kids seem to grow up fast so your time is limited when it comes to setting aside money for college. However, if your child is under the age of 18, you still have time and can use it to your advantage. Start small and make it a painless process. Have you started saving for college for your kids yet? What methods are you using?